The Ultra Technos was our most affordable alkaline water ionizer. It is no longer being sold, but we do sell the replacement cartridge filter. 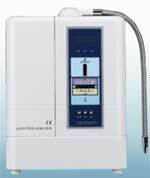 We still have several other affordable water ionizers that you can choose from. We feel that everyone should have a water ionizer. The Ultra Technos is a veteran in the water ionizer wars. It has been tried and tested. It has seen several upgrades over the years, so although it has been on the market for a while it can feel confident that you are getting modern technology with this machine. Although is has a one year warranty, you can expect to have several years of service from this machine. MICOM Solid state onboard computer circuitry - recently updated. This ensures quality and longevity of your unit. 5 levels of pH accessible by push buttons. Filter-only mode for purified water. Wipedown case with quality, sensitive design suited for Western kitchens. Stainless steel outlet hose for alkaline water. Dimensions 10.5" X 6" x 14.5"
Water Temperature Limits 36 To 89 Degrees F.